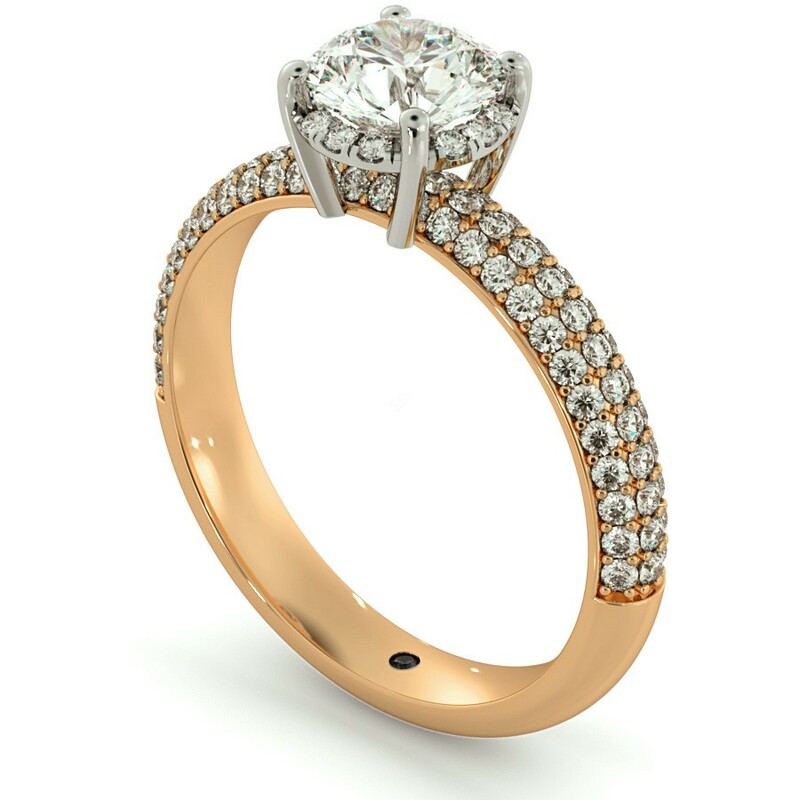 You have selected our product design HRRSD698 Micro Pave set 3 Rows Round cut Halo Diamond Ring. Delivered in 3 to 4 weeks. Contact us if you need it earlier. Finance not available. Price should be between & , loan amount should be after deposit, maximum loan amount should be . To purchase on finance add product to basket and select Finance payment method during checkout process. Read Finance FAQ. 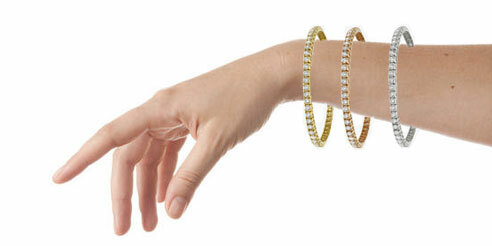 A carat is a unit of measurement used to specify the weight a diamond. One carat is equal to 200 milligrams. 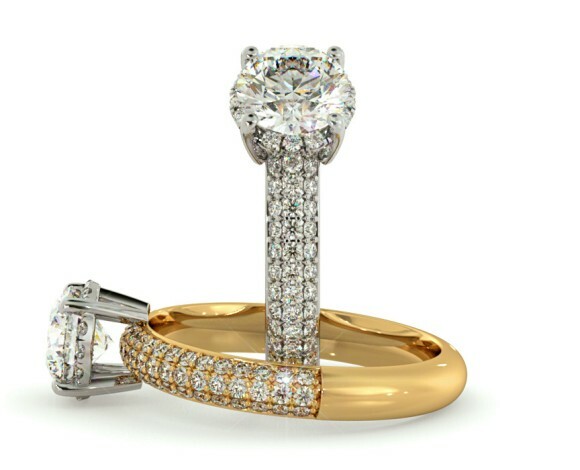 When buying a diamond ring you should choose a carat weight that suits the wearer's fingers. Selecting a smaller carat weight for thicker fingers will not suit the fingers. 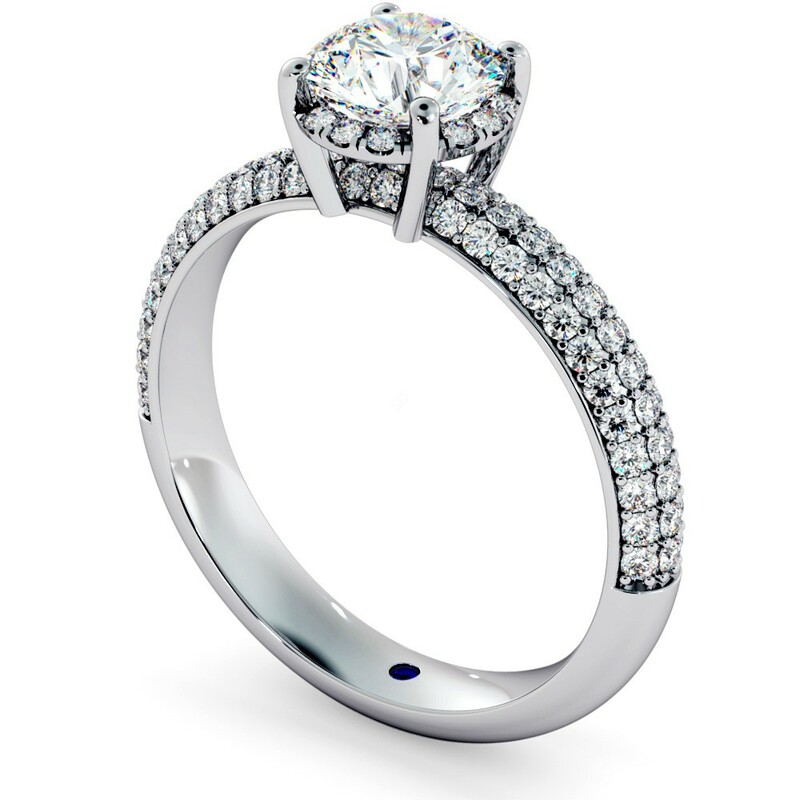 Selecting a higher carat weight for thinner fingers will make the ring look very prominent. This refers to the presence of identifying characteristics on (blemishes) and within (inclusions) the stone. Diamonds with no or few inclusions and blemishes are more highly valued than those with less clarity because they are rarer. There are two types of flaws in most diamonds. Inclusions refer to internal flaws; include flaws such as air bubbles, cracks and non-diamond minerals, clouds, feathers, crystal, knots, pinpoint found in the diamond. Blemishes refer to surface flaws; include flaws such as scratches, pits and chips. Some blemishes occur during the cutting process. Very, Very Slightly Included category (VVS) diamonds have minute inclusions that are difficult for a skilled grader to see under 10 x magnifications. The VVS category is divided into two grades; VVS1 denotes a higher clarity grade than VVS2. Very Slightly Included category (VS) diamonds have minor inclusions that are difficult to somewhat easy for a trained grader to see when viewed under 10x magnification. The VS category is divided into two grades; VS1 denotes a higher clarity grade than VS2. Typically the inclusions in VS diamonds are invisible without magnification, however infrequently some VS2 inclusions may still be visible. Slightly Included category (SI) diamonds have noticeable inclusions that are easy to very easy for a trained grader to see when viewed under 10x magnification. The SI category is divided into two grades; SI1 denotes a higher clarity grade than SI2. These may or may not be noticeable to the naked eye. Included category (I) diamonds have obvious inclusions that are clearly visible to a trained grader under 10 x magnification. Included diamonds have inclusions that are usually visible without magnification or have inclusions that threaten the durability of the stone. 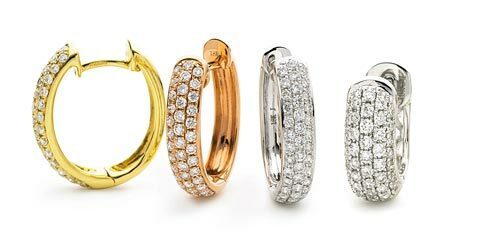 Diamond colour refers to the lack of colour in diamonds. The higher the colour grade (D is highest grade) the more colourless a diamond is. "D": Exceptional white. Colourless diamonds are the most desirable since they allow the most refraction of light (sparkle). 'D' is Pure White - the most prized colour. "E","F","G": Rare White. Special whiteness and purity with no tint of colour. A specialist trained eye could only tell the difference between exceptional white and special whiteness / rare white. "H": Good white brightness with slight tint of colour (usually yellow or brown). Diamonds of this colour offer you an excellent combination of quality and value. Compared to a higher colour graded diamond there will be a slight noticeable difference. Diamonds graded D through F are naturally the most valuable and desirable because of their rarity. But you can still obtain very attractive diamonds that are graded slightly less than colourless. A certificate tells you the diamond's characteristics. The minimum information on a diamond certificate is carat weight, colour and clarity. Certain certificates give you further details such as exact measurements, cut and fluorescence. A certificate describes the quality of a diamond but it does not place a monetary value on the gem. 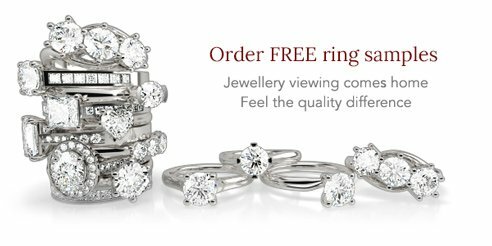 Unless constrained by budget, we always advise our customers to select a third-party certificate such as GIA / IGI or IGL (where available). This is to promote security for our customer's concerns that the certificate they receive is non-biased. 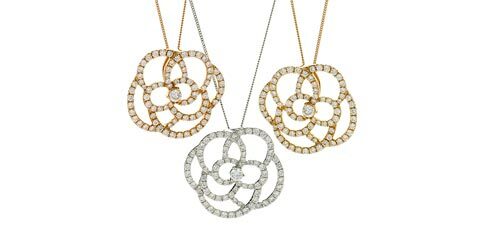 This diamond combination is unavailable in the selected colour or certificate. Please try another colour or certificate. Shop proved reliable in transaction and delivery. Diamond ring of very good quality at a fair price. Recommend this shop without hesitation. Very knowledgable and friendly service, once my item was ordered it was available in less than half of the quoted time. Thanks very much. Friendly and knowledgeable staff. Great prices. We used shining diamonds to remake an old ring based on a recommendation from a friend. The team were helpful, the pricing was very fair and the whole service was fully professional. Would recommend to friends. I Bought my Wife a beautiful necklace from Shinning Diamonds, The staff were lovely and very helpful. I would highly recommend them. Excellent service and lovely ring.